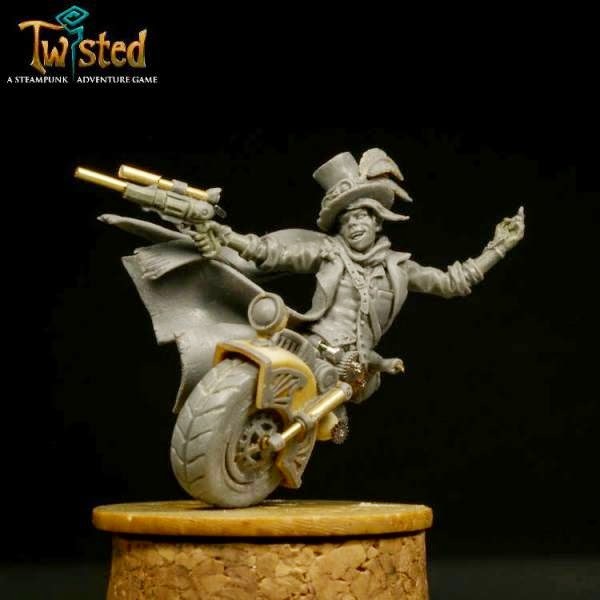 You may remember Twisted from last year’s Salute, a miniatures game that promised to blend dungeon crawling and tactical skirmish game all set within an alternative Dickensian London. And when we say Dickensian we really mean it as there’s Bill Sykes and an Artful Dodger who’s been crossed with a motorbike. When I spoke to the developers at Salute 2014 the intention was to release a board game base set that would include a starter group of miniatures and be funded via a Kickstarter. It was due to start around mid January 2015 (now) but Demented Games have had a change of heart, mainly due to the miniature development being almost complete. Instead of a starter set there will be a steady release of Collector’s Edition miniatures of the main antagonists in high resolution resin. Each will come with their in game card and a certificate of authenticity (it’s not a collector’s edition without a hand written number on a piece of paper). Later the same miniatures will be available in more hard wearing white metal “Gamer’s Edition” models. The rulebook will be available as a PDF and, further down the line, as a printed real life book. The emphasis seems to have heavily shifted from “steampunk adventure game” to steampunk skirmish game. Personally I’m a little disappointed in this news because I was looking forward to a board game set in the rich Victorian London backdrop that Demented Games where building. The reason for the change appears to be that the developers fell in love with the quality of their miniatures and weren’t happy with the drop in quality associated with board game grade plastics. Release dates are confirmed but the Twisted Game Facebook page looks to be the place to get the latest news. Excellent list! I played a bit of Splendour before Christmas - a bit of a brainful after a few drinks, but I enjoyed it. I bought the D&D starter set after Christmas to give myself a proper introduction to RPGs. So far no one in my circle has leapt at the chance to have a crack at it, but I remain hopeful.